Looking for fast, intelligent exploitation of its mass of data, the Port of Antwerp turned to Business & Decision to optimise and secure the safety and efficiency of its maritime transport. A report. Open data and data science today enable us to analyse geographical data by measuring interactions that could otherwise only be modelled with great difficulty. Demonstration. We are launching a series of three articles setting out our current vision of digital projects connected with customer relations. In this first article we will investigate the current trends for enriching a CRM and how to optimise data quality. Now organisations are preparing for the entry into force of the GDPR (General Data Protection Regulation) in 2018, the first stage for many of them will be to acquire an overview of their whole information chain. Whatever their size or business sector, enterprises are required to preserve certain documents for a given period. 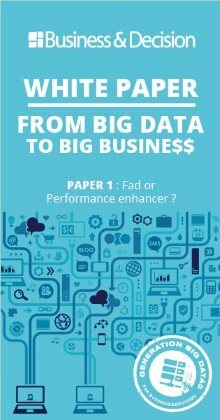 But how is Big Data changing document archiving? GDPR : what obligations for data controllers? GDPR: what new rights for your personal information? The GDPR strengthens and clarifies the rights of physical persons whose personal information is processed, and the obligations of entities that handle the processing of such data.